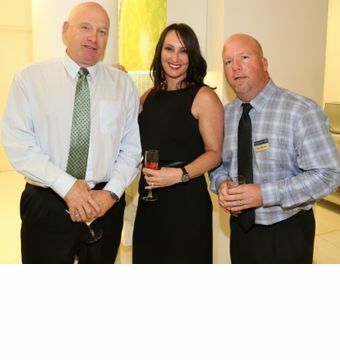 Cheryl Dixon, Head of Brand and Trade Marketing for GROHE America, with Stephen Malley, East Region Sales Director at left, and Joe Dreyer, Area Sales Manager, at right, at the kick-off party for the 2015 Hampton Designer Showhouse at the GROHE Live! Center. NEW YORK, July 16, 2015 – The newly renovated, experiential GROHE Live! 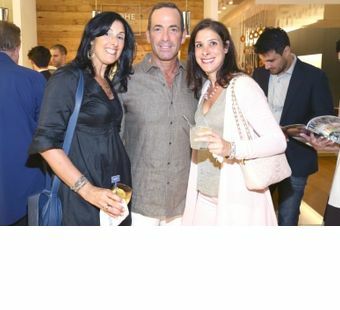 Center in the heart of the Flatiron district was the site of the kick-off party for the 2015 Hampton Designer Showhouse, presented by Traditional Home magazine and benefiting Southampton Hospital. GROHE’s premium kitchen and bath offerings will be showcased throughout the three-story Bridgehampton home, which is slated to open July 25. Designer guests and other attendees were invited to tour the showroom while sipping on their own custom crafted cocktails made with sparkling water from GROHE® Blue Chilled + Sparkling, one of the biggest innovations in the category in decades, which will be installed in the Showhouse kitchen. It combines the modern look of a designer faucet with a high-performance filter, cooler and carbonator for a choice of filtered and chilled, medium sparkling or full sparkling water all in the same tap. Showhouse designers, from left to right, Katharine Posillico McGowan, Keith Baltimore, who is working on the master bath, and Diane Guariglia, designing the master bedroom, take time out of the festivities for a photo op. 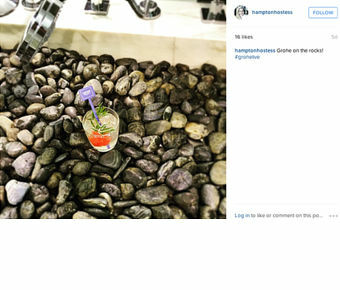 This “GROHE on the rocks!” Instagram photo by designer Barbara Page of a cocktail made with sparkling water from the GROHE Blue® Chilled + Sparkling system was the winner in the event’s social media contest. “We were honored to host the kick-off event in our showroom and very much look forward to the Hampton Designer Showhouse,” said Cheryl Dixon, Head of Brand and Trade Marketing for GROHE America. For more information on the Showhouse and to purchase tickets, please visit www.hamptondesignershowhouse.com. The Hampton Designer Showhouse is produced by Hampton Designer Showhouse Foundation, Inc. (HDSF, Inc.). HDSF, Inc. is led and operated by a dynamic team of experts from the worlds of marketing, public relations, fundraising and special events production. They have combined their talents to produce what is now recognized as one of the country’s most successful Showhouses. Hampton Designer Showhouse Foundation, Inc. is a 501 (c) (3) corporation. As the largest upscale shelter magazine in America, Traditional Home celebrates the union of timeless design with modern living, inspiring almost 5 million design lovers to reinterpret classic elegance in a thoroughly personal way. From home, garden, and green living to food, entertaining, and travel, the magazine is a tribute to quality, craftsmanship, authenticity, and family—a trusted resource that respects the past, lives in the present, and embraces products designed for the future. For more information, please visit www.traditionalhome.com. And for more great design ideas, check out Traditional Home's free online magazine, TRADhome. Throughout more than a century of service, Southampton Hospital’s long tradition of exceptional care and compassion for patients and their families has never wavered. More than 1,700 physicians, nurses, clinicians, staff, volunteers and Board Members take personal pride in the Hospital’s record of excellence and commitment to healthcare on the East End. Comprehensive programs at the Hospital cover a full-range of specialties and an extensive network of conveniently located satellite facilities from Westhampton to Montauk provides access to primary care, laboratory, radiology, and wellness services close to home. In addition, the Hospital sponsors informative health and wellness programs through partnerships with community organizations and libraries. For more information, visit www.southamptonhospital.org.